View of “food track,” 2019. Leopold Kessler’s interventions into legal apparatuses, commercial services, and public spaces stem from perceptive and drily humorous observations of urban life, and display an acute awareness for the mundane systems that keep contemporary society running. This exhibition, “food track,” infiltrates a quintessential experience of modernized city life—ordering food via a smartphone app—with a trio of videos and several corresponding props. The first video is a simple recording of couriers from the German-owned delivery service Foodora supplying pizzas to Kessler. 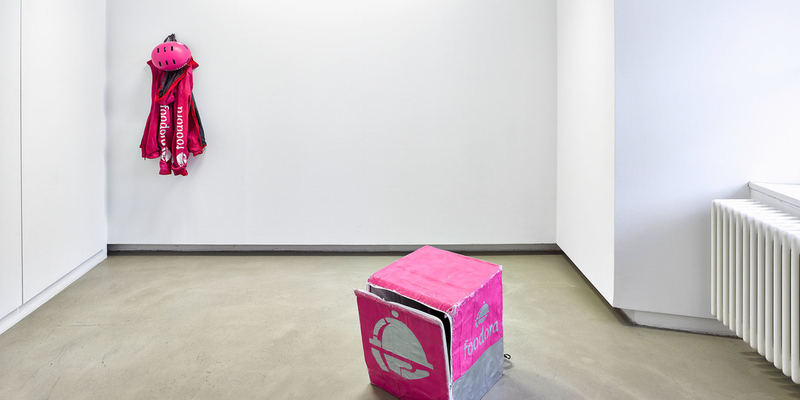 The second video, shot with a wearable camera or covertly by a friend, shows the artist dressed in the company’s distinct pink uniform and holding its branded carrier box, all in fact hand-made by the artist, who rides his bike and pretends to be a courier. He walks into restaurants and takes the orders awaiting delivery. He doesn’t always succeed—on one occasion, the real dispatcher turns up at the same time. When the attempt is successful, he either eats the food himself or, in one instance, returns the food to the restaurant, claiming a mix-up. Astonishingly, he never seems to get into any trouble—presumably because these blunders are a common occurrence—which heightens the absurdity and poignancy of this modest hacking of the service economy. The third video stages a robbery of a courier by two men who take the food and leave the empty box on the street. The three videos respectably represent documentary, intervention, and theatrical performance around the latest addition to the urban lifestyle. Kessler’s works also offer a unique take on psychogeography. He reorganizes the city not with the rhetoric of hallucinatory wonderings or revolutionary romanticism, but through the perspective of labor, infrastructure, and maintenance, turning these systems into a stage for urban black comedies.